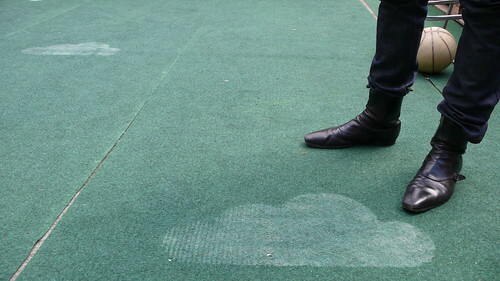 Some of Soundcloud’s money went on its rooftop tiles. How much would you pay for them – and the company? Photo by unfolded on Flickr. A selection of 13 links for you. Perfectly shaped. I’m @charlesarthur on Twitter. Observations and links welcome. Ignighter got 50,000 registrations, but it wasn’t enough to reach critical mass, and the founders considered abandoning their business. Then, they noticed they were getting as many sign-ups a week from India as they did in a year in the USA. You can’t predict the unpredictable, but, like, whatever, now I’m making a prediction: Many of your next customers will come from the area circled below, if only because there are more human beings alive in this circle than in the world outside the circle. when I said that voice input ‘works’, what this means is that you can now use an audio wave-form to fill in a dialogue box – you can turn sound into text and text (from audio or, of course, from chatbots, which were last year’s Next Big Thing) into a structured query, and you can work out where to send that query. The problem is that you might not actually have anywhere to send it. You can use voice to fill in a dialogue box, but the dialogue box has to exist – you need to have built it first. You have to build a flight-booking system, and a restaurant booking system, and a scheduling system, and a concert booking system – and anything else a user might want to do, before you can connect voice to them. Otherwise, if the user asks for any of those, you will accurately turn their voice into text, but not be able to do anything with it – all you have is a transcription system. And hence the problem – how many of these queries can you build? How many do you need? Can you just dump them to a web search or do you need (much) more? …fundamentally, you can’t create answers to all possible questions that any human might ever ask by hand, and we have no way to do it by machine. If we did, we would have general AI, pretty much by definition, and that’s decades away. Given that you cannot answer any question, there is a second scaling problem – does the user know what they can ask? I suspect that the ideal number of functions for a voice UI actually follows a U-shaped curve: one command is great and is ten probably OK, but 50 or 100 is terrible, because you still can’t ask anything but can’t remember what you can ask. This captures the problem with voice services that so many are getting excited about in the home: Alexa and Google Home can do a couple of things. But without heroic measures, they’re not things you couldn’t just do yourself anyway, and probably faster. The Android operating system from Alphabet’s Google is inching extremely close to passing Microsoft (MSFT) as the most popular operating system (OS) for Internet usage, according to February 2017 data collected by StatCounter from usage across desktop, laptop, tablet and mobile. “This is hugely significant for Microsoft,” StatCounter CEO Aodhan Cullen told TheStreet. “It’s coming close to the end of an era with Microsoft no longer having the dominant operating system. It took the lead from Apple in the 80s and has held that title ever since.” This new development is coming after Google’s Chrome browser has already beat out Microsoft’s Internet Explorer and Edge, he added. According to last month’s data, Windows took 38.6% of the OS market share worldwide, vs. a close 37.4% grabbed by Android. This numbers are significant considering Windows held 82% of the global Internet usage share in 2012, vs. a measly 2.2% held by Android. SoundCloud’s stall has been out in the open for some time. Investors pegged its value at $700m in 2014, and since then it has raised money twice — including last year’s $70m Twitter investment — at the same valuation. The service says it has 175 million monthly unique users, but it hasn’t updated that number since 2014, either. Meanwhile, efforts to boost revenue by adding a paid subscription model to its free, core service, don’t seem to have generated much traction. What do we think – end of the year? Can’t quite see Spotify wanting to buy it, because of the price; it isn’t that flush. Apple wouldn’t quite want it; the fit isn’t good with its down-the-line aim at the full commercial business. That’s a problem. The wind that comes off the mountains across Cook Inlet in southern Alaska still feels plenty cold in February. But lately it’s not quite cold enough. From 1932 to 2017, the daily minimum temperature in Homer, a city on the eastern shore of the inlet, averaged 19F in February. Narrow that to the past 10 years and the average rises to 21F; for the past five years, 25F. Last February, Homer’s daily low averaged 30F—just two degrees colder than in Washington, D.C., 1,200 miles closer to the Equator. As warmer winters arrive in Alaska, this city of 5,000 offers a glimpse of the challenges to come. Precipitation that used to fall as snow lands as rain, eroding the coastal bluffs and threatening the only road out of town. Less snow means less drinking water in Homer’s reservoir; it also means shallower, warmer streams, threatening the salmon that support Cook Inlet’s billion-dollar fishing industry. Heavier storm surges are eating away at Homer’s sea wall, which no insurance company will cover and which the city says it couldn’t pay to replace. Warmer water has also increased toxic phytoplankton blooms that leach into oysters and clams. When eaten by humans, the toxins can cause amnesia, extreme diarrhea, paralysis, and death. Alaska was once at the vanguard of states trying to deal with global warming. In 2007, then-Governor Sarah Palin established a climate change subcabinet to study the effects of warmer weather and find policies to cope with them. Over three years, the legislature provided about $26 million in funding. But Palin’s successor, Republican Sean Parnell, disbanded the group in 2011. That year, Alaska withdrew from a federal program that provides funds for coastal management because of concern the program might restrict offshore oil extraction. Since then, lower oil prices, combined with dwindling production, have left the state with a budget crisis that’s among the worst in the U.S. Just when climate change is having real impact, Alaska has less and less capacity to deal with it. I remain convinced that the US is slowly committing a form of hari-kiri through its leaders’ disbelief in inconvenient scientific reality. This needs, as they say, some unpacking. gTLDs are global top-level domains: a huge number of them went live back in October 2013 (here’s a list of those purchased). They’re domain suffixes such as “.xyz” (operated by Google) or “.win” or “.wang”. But who wants those? People just want good old dot-coms, or dot-their-country. So the registrars, who have stumped up huge amounts, had to get a return on investment. When nobody new is entering the market, you have to put up rents. Oddly, data shows that it’s Google’s .xyz which is the busiest new gTLD, with more than 6m registrations, giving it 23% share. It falls off pretty fast after that. Expect more stories like this at the next domain registrar dinner party you go to. The Google Pixel and Pixel XL easily became our picks for the best smartphones of 2016, but they’ve not been without faults ─ and a lot of them. Since release, Google has been dealing with issues such as battery hiccups, speaker popping, camera bugs, and much more. Now, some Pixel owners are reporting a new issue with their microphones. This issue is apparently affecting both Pixel and Pixel XL owners and causes the microphone to completely stop working, at least at certain times. It seems like audio tends to work and then not work depending on the conditions affecting the phone, but regardless, this is a pretty serious issue for Pixel owners, especially those who need to make regular phone calls. The most common problem is a hairline crack in the solder connection on the audio codec. This will affect all three mics and may result in other issues with audio processing. This problem tends to be transient because of the nature of the crack. Based on temperature changes or the way you hold the phone, the connection may be temporarily restored and the problems may go away. This is especially frustrating as a user because, just when you think you’ve got it fixed, the problem randomly comes back. We believe this problem is occurring << 1% of phones and often happens after a few months of use (it could be triggered by dropping the phone that may not cause any visible external damage). OK, it may be a tiny proportion of phones – but add to those other problems people have reported? That doesn’t seem good. A big chunk of those “likes,” “retweets,” and “followers” lighting up your Twitter account may not be coming from human hands. According to new research from the University of Southern California and Indiana University, up to 15% of Twitter accounts are in fact bots rather than people. This isn’t necessarily bad; lots of accounts simply tweet links to formal organisations, or notice things. It’s the humans who add value. The “how many users?” factor fails to recognise is how much value the human users generate, or derive, from that. stores can buy Wi-Fi equipment that logs smartphones’ MAC addresses, so that shoppers are recognized by their handheld when they next walk in, or walk into affiliate shop with the same creepy system present. This could be used to alert assistants, or to follow people from department to department, store to store, and then sell that data to marketers and ad companies. Regularly changing a device’s MAC address is supposed to defeat this tracking. It isn’t enabled on about 70% of Android phones (including most Samsung devices). And Apple broke it (if you know where and how to look) in iOS 10, having enabled it well before, possibly for HomeKit compatibility. While often made out to be fierce competitors, Apple CEO Tim Cook and Google CEO Sundar Pichai recently shared dinner and a conversation together in Sillicon Valley. Images of the meal were shared on Facebook and discovered on MacGeneration. 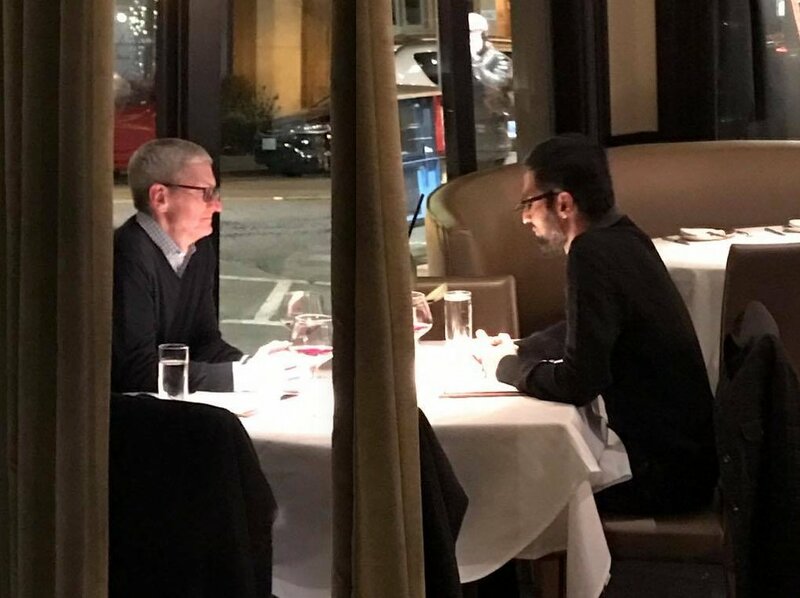 The TMZ-like spy shot shows Cook and Pichai talking to one another over dinner, but not much else is known about the conversation. The two powerful executives have traded blows in the past, with Tim Cook calling Android a “toxic hell stew” and Pichai responding by saying Android is just a more popular operating system than iOS. Some suggest Cook is drinking wine; I don’t think so. Looks like water to me. I wonder if they’re discussing something to do with Trump and the immigration ban: they have common cause there, and it’s a current topic which affects a lot of their staff. This all started with reports across the web that the update was breaking Android Pay for users, including a handful in the Nexus 6 subreddit. The real situation here, though, is that the update seems to be breaking SafetyNet, which is software that makes sure that unlocked or otherwise modified phones aren’t able to run certain apps with sensitive data — like Android Pay. In response, Google has been replying to plenty of Nexus 6 owners on Twitter saying that they’re “aware of this issue and our team is investigating.” The update has also been pulled from Google’s factory image website and the OTA website. If you’re a Nexus 6 owner and your Android Pay app recently broke, this is probably why. The Nexus 6, released in 2014, but which was still on sale in 2015? The stunning part here is that an update to a Google phone could kill core functionality. This doesn’t speak well to the narrative of Google’s awesome l33t s0ftwar3 ski11z. Google’s reCAPTCHA is the leading CAPTCHA service (that’s “Completely Automated Public Turing test to tell Computers and Humans Apart”) on the Web. You’ve probably seen CAPTCHAs a million times on sign-up pages across the Web; to separate humans from spam bots, a challenge will pop up asking you to decipher a picture of words or numbers, pick out objects in a grid of pictures, or just click a checkbox. Now, though, you’re going to be seeing CAPTCHAs less and less, not because Google is getting rid of them but because Google is making them invisible. The old reCAPTCHA system was pretty easy—just a simple “I’m not a robot” checkbox would get people through your sign-up page. The new version is even simpler, and it doesn’t use a challenge or checkbox. It works invisibly in the background, somehow, to identify bots from humans. Google doesn’t go into much detail on how it works, only saying that the system uses “a combination of machine learning and advanced risk analysis that adapts to new and emerging threats.” More detailed information on how the system works would probably also help bot-makers crack it, so don’t expect details to pop up any time soon. OK then. So we’ll have robots watching us to make sure that we aren’t robots, and when it thinks it sees a robot the robot will challenge the robot, or perhaps human, to prove they’re aren’t a robot, but a human. the power of Trump’s media diet is so potent that White House staffers have, to varying degrees of success, tried to limit his television watching and control some of what he reads. The president’s cable TV menu fluctuates. Fox News is a constant, and he also frequently watches CNN despite deriding it as “fake news.” Though he used to watch “Morning Joe,” a Trump aide said the president has grown frustrated with his coverage on the MSNBC program and has largely stopped. For Trump, watching cable is often an interactive experience. More than dozen times since his election, he has tweeted about what he saw on TV just minutes before. That first sentence is concerning, though. They know it’s crap. They just can’t persuade him of the fact.